The skill from Angelika was soon noticed. Besides of being a person who spoke many languages and played several instruments, her best talent was in painting. At 12, different bishops and nobles posed for her. She was invited to England, but her history painting didn’t had the success expected, due that the English preferred to buy portraits and landscapes; so she decides to get back to the continent, more specifically, to Italy, where she meets her husband and, with him, she retires to Rome. There she meets Goethe, who admires her work. She continues to paint for 25 years until the day she dies. That day, Antonio Canova, an amazing neoclassic sculptor, organized a huge funeral procession for her. Gender, at the end of the 1700, was a big issue. Despite Kauffmann’s talent, several times she was criticized because men, in her paintings, were more like masculine women. But of course, it wouldn’t be strange if we know that women had no access to male models and were expected to only paint portraits and still life paintings. But Kauffmann refused that restriction and liked to paint women in myths and history like Venus, Cleopatra, Helen, etc. 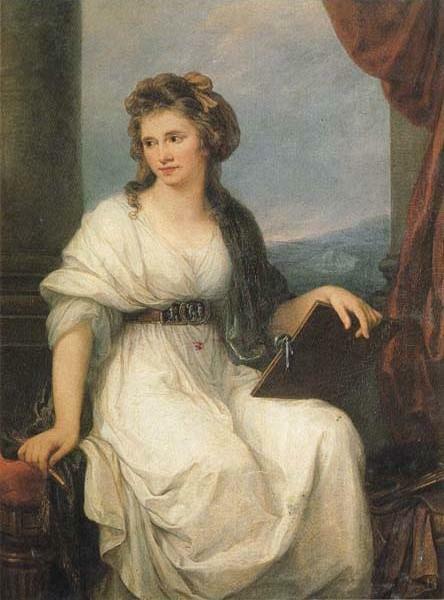 In the Self portrait, we see her with a Roman dress gathered to the neoclassic way, with a belt under her breast. Her hair is tied back by a green ribbon and her look is deviated from the spectator. At the back, we see a window with mountains and, in her hand, we see a paintbrush and a palette. This way, Kauffmann identifies herself with nature and her trade. ~ by Álvaro Mazzino on August 9, 2010. That $580 price point is about 42 percent, or $420, off the original manufacturer’s suggested retail price. The handsets are being sold new and with the orginal packaging. This entry was posted on August 9, 2010 at 10:55 and is filed under Neoclasicism.You can follow any responses to this entry through the RSS 2.0 feed.You can leave a response, or trackback from your own site.